Hey guys! Gosh, I'm kind of excited about today's blog post. Then every few months I put a few away and grab a couple more from my big bookshelf. That way I'm really using all the resources I have in my home, always getting new recipe inspirations, and really, really weaning myself from the dependency of my beloved Pinterest. Not that there is anything wrong with that site! I just have so many beautiful and truly delicious cookbooks, that I want to get in them and dirty those pages with butter and sauce stains. Ahhh, nothing like a good used cookbook, right? 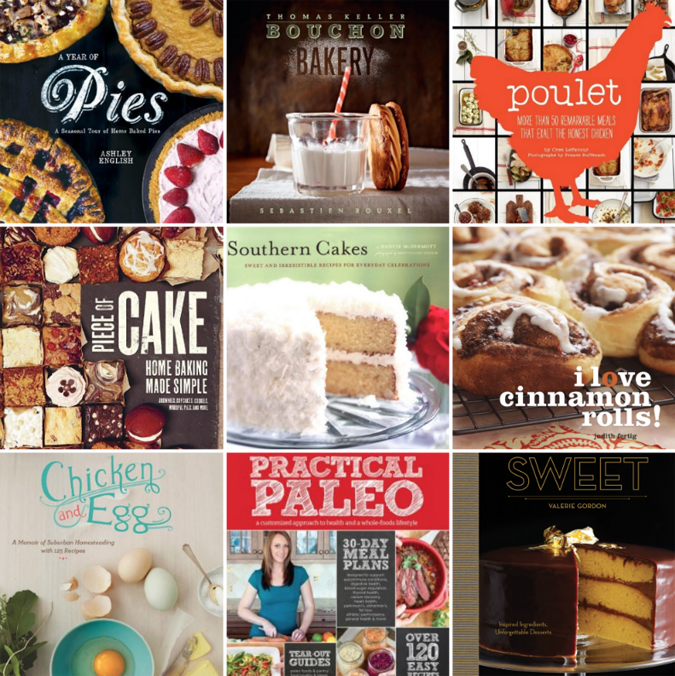 So, right now- these 9 cookbooks are on my desk and constantly being looked through. Then there are a few that I put back into the larger collection and end up going back to regardless. Some of these I just luuuuuuuuuurve! 1. A Year of Pies, by Ashley English // When I said I really love some of these books, this was one of them. I cannot get enough of this dang book! IT'S ALL ABOUT PIES guys! PIES! I flipping love pies! Pie...like, a good, homemade pie...might be my number one love language. If you love me, you'll always show up to meet me, with pie. Plus, this book was gifted to me by a very dear friend, which makes it super duper extra special. In fact, this recipe was inspired by one of Ashley's delicious recipes. 2. Bouchon Bakery, by Thomas Keller // Another fabulous cookbook, this one isn't for the faint of heart. With measurements like 1 1/2 teaspoons of egg, your cooking expertise will be pushed to grow and challenged a bit, but in a really, really good way. His recipes are gorgeous, simple in ingredients and always turn out amazingly delicious. This book is a must for any of you wanting to step up your game. You may remember this recipe? Totally inspired by this book. 3. Poulet, by Cree LeFavour // Again, this is one of those cookbooks I can't stay away from. If it's on my desk, I look through it. If it's in the big bookshelf, I still gravitate towards it. Such a fun book! With recipes all focusing on, you guessed it, chicken- you'll be sure to revamp your basic poultry dinner! We eat a lot of chicken! Not only are there chicken recipes, but they are categorized by region (American chicken, Latin chicken, East Asian, African, etc) and include sides that go with that particular dish as well! You may remember this amazing coconut curry soup? Yep, inspired by this book! 4. Piece of Cake: Home Baking Made Simple, by David Muniz // This is a newer book for me, but don't let that deter you. It's got some real gems and, like the cover states, all the recipes are really, really easy. I've already made these cookies for the Great Food Blogger Cookie Swap and fell in love. 5. Southern Cakes, by Nancie McDermott // This cookbook is dear to my heart. It was one of the first cookbooks my husband ever bought for me once we were married. Valentine's Day, 2009 to be exact, hehehe. He has such faith and encouragement for me in my baking career and every time I get into this book, I'm reminded of that. It's packed full of amazing southern influenced desserts! This delicious recipe was inspired by this book and indeed made for the man in my life! 6. I Love Cinnamon Rolls, by Judith Fertig // This is actually my husband's cookbook, but naturally I use it more than he does. You see, Bill Main loves cinnamon rolls. Like, so much that "love" doesn't even do his obsession justice. This man goes kooky bonkers for a cinnamon roll. "What would you do for a Klondike Bar?" more like, "What wouldn't he do for a cinnamon roll?!" It's ridiculous. So naturally I bought this dang thing for him; you know, to feed that healthy obsession. We've had a lot of fun baking desserts together from it. You may remember this recipe? Yep, inspired by this book. 7. Chicken and Egg, by Janice Cole // Another cookbook devoted to poultry?! Yeah. When I say we eat a lot of chicken, I ain't kiddin. Chicken and eggs are a big time staple for us. Lean clean protein pro vida! That being said, there's only so many ways my brain can naturally come up with new and exciting things to do with the stuff. I need as much help as I can get :) I love this book because, like Poulet, it's categorized nicely. This time though, by season instead of region! Neat, right?! So with whatever season we're in (i.e. : summer, fall, winter, spring), I'll head to that chapter and get inspired by delicious recipes featuring fruits and veggies that are freshly available that time of year. Included are both savory and sweet recipes! Score. 8. Practical Paleo, by Diane Sanfilippo // Another newbie to me, this cookbook has really been an eye opener to the world of Paleo cooking! We Mains fortunately do not have to eat gluten free and Paleo, but it's fun to experiment and cook that way occasionally anyway. I know some of my readers do have to eat with these dietary restrictions, so I like to educate myself as much as possible and provide recipes on SLBS's blog all can enjoy. In fact, I just made an amazing "Teryaki" sauce recipe from her book last night! It was so cool! Fresh pineapple cooked down with water, garlic and ginger and then pureed with sesame oil! Both my husband and I were chowing down! 9. Sweet, by Valerie Gordon // Just get this book and look through the pictures friends. It's ridiculous. Every. Single. Page makes my mouth water and my eyes pop out of my head. This book would be in the same category as Bouchon Bakery; a good-for-you baking challenge, for any of you cooks out there wanting to up your game. So that's it! That's a little tiny insight into my crazy cooking and baking world :) What cookbooks are on your shelf right now?? What are you guys loving right now? Have any of you tried any of these? Totally linking up todays post with Chantel! uh. The cinnamon rolls one. Holy cow. But then if you made them orange rolls... OH MY HEART! Home Baking Made Simple, right up my ally! I want to look into one of those 5 ingredient cook books. You are such a cooking artist! I have a copy of Practical Paleo too! I hate being a fussy eater around friends, so I can only say I mostly eat paleo.... but loving the twist on some of those classic recipes. The zucchini noodle salad is a life saver for my busy last minute bible study pot lucks. Also totally digging the sauerkraut, bacon mocha brownies, pumpkin pancakes, spaghetti-squash bolognese and oh dear... I could go on. So far, I'm totally loving it! I've tried two or three recipes and they've all been winners. Yeah! Are you a fan or orange things?? Have to keep that in mind! Such a fun book. I saw it at a coffee shop around our house about a year ago and couldn't stop thinking about. Then bill got it for me and I was so excited! Have tried a few recipes since- they're all so drool worthy. Ahhhh thank you for this info! I'll HAVE to try those out! The zucchini noodle salad and bacon mocha brownies sounds especially yum! YES! Those cheap little canned orange rolls from the store... Oh my. My fave though was Orange French Toast at a bed and breakfast we went to one time. Ugh. No other french toast can compare! Looks like I may have to hang out in the cook book section of the bookstore more often! I have found a lot of recipes on Pinterest that I now use all the time, so I made my own cookbook with them... aka a binder with page protectors filled with printed copies. Hahaha! But that Pie cookbook looks amazing!! At our wedding we had pie instead of cake because pie is awesome, but I am always on the lookout for more pie recipes. Checking from Jack of All Trades. Thank you for sharing!! I'm totally cookbook obsessed though I always get them out from my local library first (if they have it) to see if it's worth dishing out the money for. I'm going to add some of these to my list to take out! these are all so wonderful!! You should make a cook book one day with all the things you have learned on the way!